I have been considering ‘helps’ for Muddy Boots and I think these are the main five ones. The location The allotment is a great resource for teaching children about food growing. It is run as a community allotment by a committed group of volunteers. I think Community allotments are a great idea as they spread out the responsibility for an allotment and make food growing less of a chore and more enjoyable. On my PDC I designed the education space for the allotment with Muddy Boots in mind. So the space is perfect for this group to use immediately as well as providing lots of scope for future activities. To explore this further, I have used PASTE to analyse the helps within the location. PLANTS – Within the education space there are lots of strawberry plants, runner beans growing up a den structure, an apple tree planted with a guild of supportive plants, flowers in pots, a pizza pot containing tomatoes, chilis, peppers and herbs and welly boots planted up with annual flowers. The wider allotment plot contains a young forest garden and about every type of vegetable you could wish for. ANIMALS – I have seen foxes on the site, also there are chickens on other people’s plots plus the usual wide array of birds, insects and pond life. STRUCTURES – We have a large summer house type shed and another shed to store equipment. We have a gazebos. There are two polytunnels on site and a small greenhouse and another large shed. There is a toilet block and hardstanding for parking. TOOLS – I have access to lots of children’s hand tools for gardening plus small-sized spades, rakes and folks. I have two small wheelbarrows, gloves, watering cans, art materials, compost, plant pots and a good stash of seeds. EVENTS – The education space is used by the adult gardening group too every Tuesday. The volunteers also use the paces when they have their tea breaks. The space is also used occasionally for educational workshops, events, meetings, seed/plant swaps, the allotment open day and celebration events. My skills and experiences I have worked in arts education for many years and more recently have been gaining experience in environmental education. I have skills in teaching, project and event management and leading workshops. I am keen to further my skills in these areas, so taking on Muddy Boots as one of my Diploma projects seems to be paving the way for a possible future career path once my children get a little older. Materials and resources from previous years I have been gifted lots of resources from the previous two years of Muddy Boots sessions. When Vicky left her post she ensured we had lots of the ‘stuff’ we needed to carry on the group without being out-of-pocket.There is a shed we can store everything in, children’s tools, some seeds, some books, tea making facilities, hand washing stuff, a first aid kit etc. Freedom As I am taking this on in a voluntary capacity, I am free from the constrains of being under a certain business or organisation. I am free to steer the ship how I (and the participants) wish to. We have a lot of freedom as long as we abide by the rules of the allotment society and follow the H&S rules set by the insurance provided by TCV. The participants The group of parents and children attending sessions tends to ebb and flow throughout the seasons, with a few families forming a core group. Amongst these people there are many skills, ideas and experiences. I wanted to harness these wide-anging skills and encourage them to help with the group as much as people felt willing or able to. To gather information from the participants I designed a set of four questions based on ones in Looby’s book. ‘People and Permaculture’ Looby mentioned ‘gains and gives’ and I added grins and groans. I drew up these questions onto large sheets of card and asked the group to note down their thoughts in a type of brainstorm. I started this activity when I saw some members of the group at a spring lunch at the allotment. I continued it during the first Muddy Boots session on 2nd May. 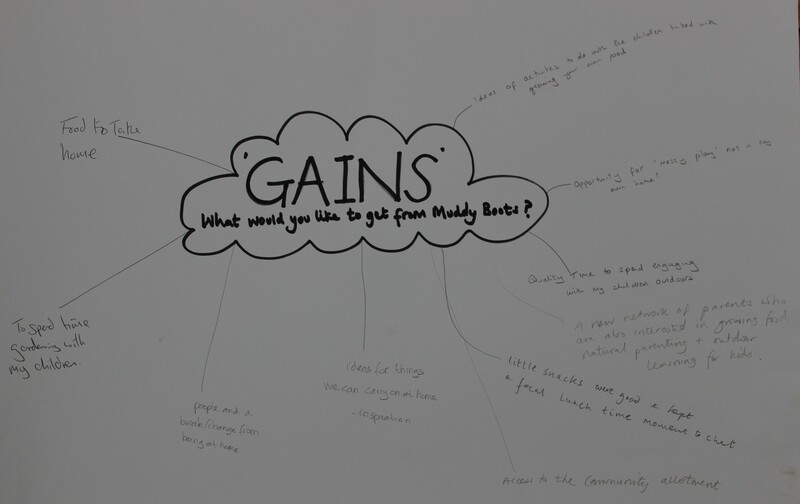 Gains – What do people want to get out of the group? I was hoping that comments here would help with my planning and give something to measure successes against. Comments showed that people wanted opportunities for messy play, a chance to meet like-minded parents and for their children (and themselves) to socialize. They also wanted to be outdoors with their children and to be inspired by food growing activities that they could replicate in their own homes and gardens. Gives– I wanted to find out what people were willing to contribute towards the group; time, skills, leadership, plants, seeds, toys, money, ideas etc. I am really pleased that to date, four parents have offered to run sessions. People have also offered to donate plants, seeds, compost and their time in setting up and packing away. I have also had help with tea and coffee-making, washing up and everyone seems very happy to contribute towards the shared snack time. We ask for a small financial donation towards each session. £2.00 for 1 child and £1 for each additional child is suggested. This goes towards running costs and materials. I actually think we could put up this charge next year to make the group more sustainable in the longer term. Grins- This asked what were people’s favourite things about muddy boots, what were the most successful activities last year and what the kids enjoyed the most. I got lots of comments here. People liked letting their kids get messy, they loved the relaxed, safe, inspiring and welcoming outdoor environment. 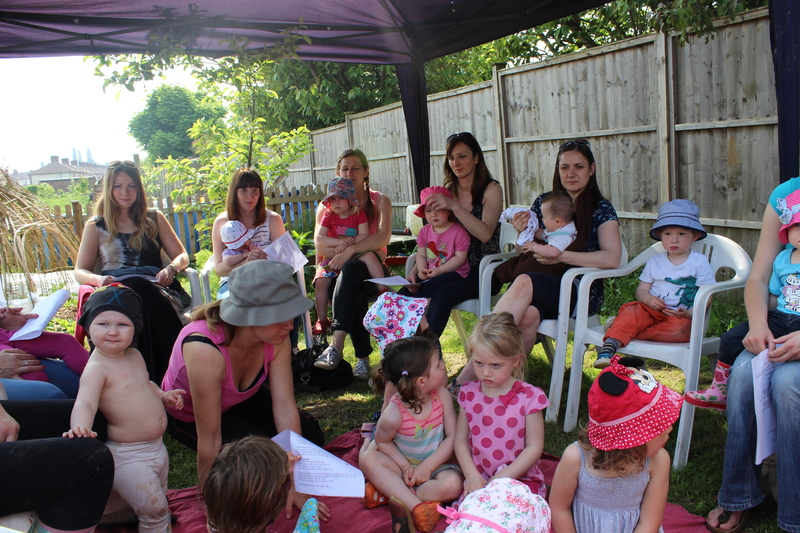 They liked sharing food, harvesting food and flowers and story time was popular too. The four g’s activity was successful and a great starting point for my planning. The only criticism was that people were very new to the group and so quite shy about expressing opinions, particularly criticisms or anything negative. This was slightly frustrating for me, as I actively waned to hear what people didn’t like so that I could change it! Maybe a more private type of feedback would have led to more involvement? This entry was posted in Uncategorized and tagged 10 Designs, 4 G's feedback, brainstorm, community allotment, design web, group consultation, Helps, Looby Macnamara, Muddy Boots, PASTE, Permaculture, Permaculture Diploma by emilycrofton. Bookmark the permalink.